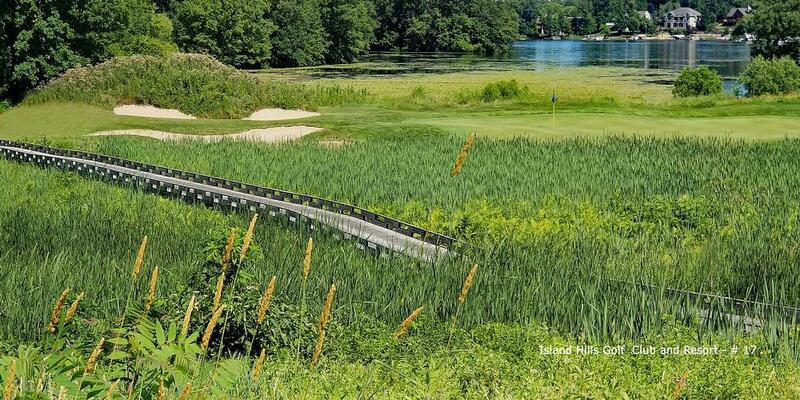 Tucked away in the midst of Michigan's Amish country, midway between Chicago and Detroit, is Island Hills Golf Club & Resort. Here, you'll be treated like royalty as soon as you pull into the parking lot. An attendant will load up your bag and whisk it away to the clubhouse. Venture inside to the pro shop and a friendly member of the Island Hills staff will greet you and help get you on your way. Because this can be such a stern test of golf, I would advise you to spend a few minutes at the practice area before your round. It's located between the 1st and 10th tee. There's also a large practice putting green to give you a better idea of what awaits you on the course. 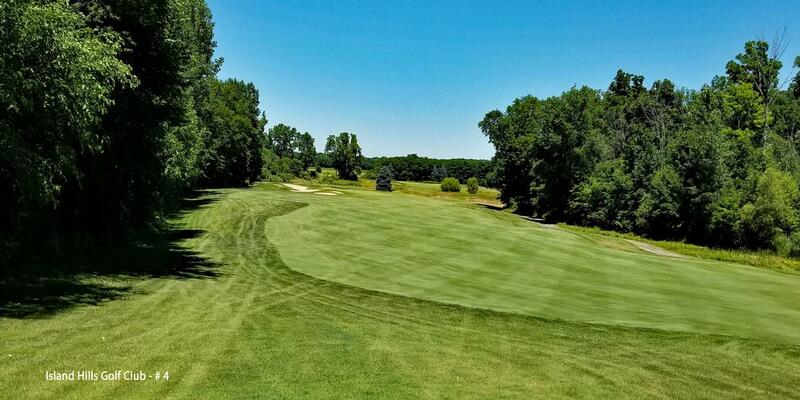 The 18-hole championship layout at Island Hills was designed by award-winning golf course designer and architect Raymond Hearn, who has taken this 220-acre tract of land and transformed it into a golf course masterpiece. 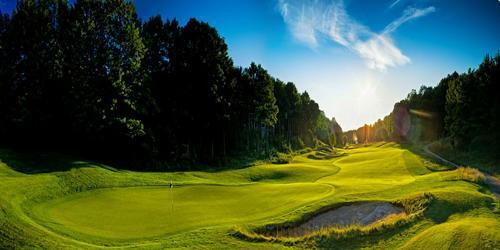 Island Hills offers 18 of the most unique and scenic holes you'll find in this part of Michigan; it also has five of the best finishing holes you'll find anywhere in the state. 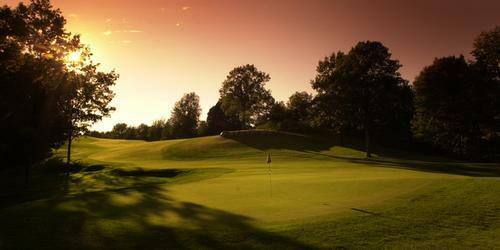 Over the years, Island Hills has been selected by Golf Digest as one of the top five golf courses in Michigan. Island Hills offers golfers of all skill levels and abilities 8 sets of tees; 4 for men and 4 for the ladies/juniors. The course can play anywhere from 7,074 - 2,955 yards with slopes that vary from 135 down to 117. 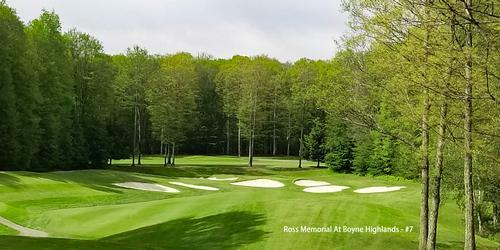 At 6,218 yards (69.6/125) the White Tees provide a fitting challenge for any double-digit handicapper. 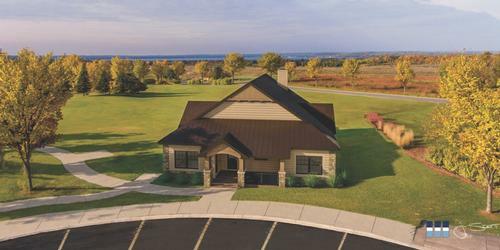 At Island Hills, you'll experience a little bit of everything: wide open meadow prairie holes, tree-lined fairways that play through hardwood forests, low-lying wetlands, creeks and streams and views of rolling pastures and Lake Templene. 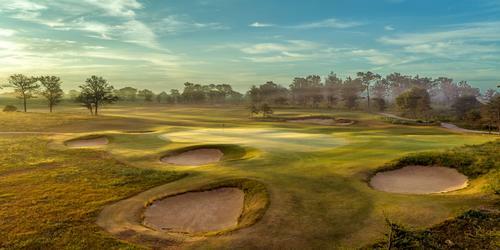 Each hole makes its mark on the course and leaves you with 18 distinctly different memories. These days many golfers, especially millennials, don't want to take all of the time it requires to play a full round of golf. Island Hills offers several alternatives, all on one 18-hole layout. The course can be played as a 5, 7, 12 or 18-hole course and can be played in less than an hour. Not having the time to play is no longer an excuse at Island Hills. And, if you don't feel like lugging your clubs around, Island Hills offers both left and right-handed golfers the use of Adams Golf Clubs for FREE. Number 2: Par 4, 403 yards. This a beautiful hole that doglegs to the left after playing out to the right off the tee. The bunker on the right side of the fairway serves as a great aiming point off the tee. You may want to consider an extra club on your approach shot into this elevated green. Two bunkers on the right side catch anything short and right; but really shouldn't come into play, especially the one in back. Birdies are rare here, especially with a back left pin that makes for a small landing area. Number 14: Par 5, 613 yards. This hole is simply named "Long," and with good reason. From the Blue Tees it plays 613 yards. Favoring the right side of the fairway with both your tee shot and layup will go a long way in setting up the best approach angle into the green. Bring your approach shot in high in an effort to hold the green and avoid the large, deep bunker on the left. Par is an accomplishment here. Number 16: Par 4, 300 yards. One of the most picturesque holes on the course. It's short and requires something less than driver off the tee. It also requires control on your tee shot to avoid the water on the left and leave something manageable into the green. Again distance control on your approach shot is critical as the green has three levels. A far-right pin placement is both tricky and fun as there is no way to avoid hitting over the water. Number 17: Par 3, 174 yards. Number 17 is Island Hill's signature hole and also one of the most photographed holes in the state. The hole plays downhill to a green well protected with sand and a great view of Lake Templene in the background. Typically, Number 17 plays one club less than the stated yardage. Hit the green off the tee and get ready to collect some money from your friends. Number 18: Par 5, 517 yards. Many golf organizations see this hole as one of the best par 5s in the Midwest and, with a well-placed tee shot it can be conquered. 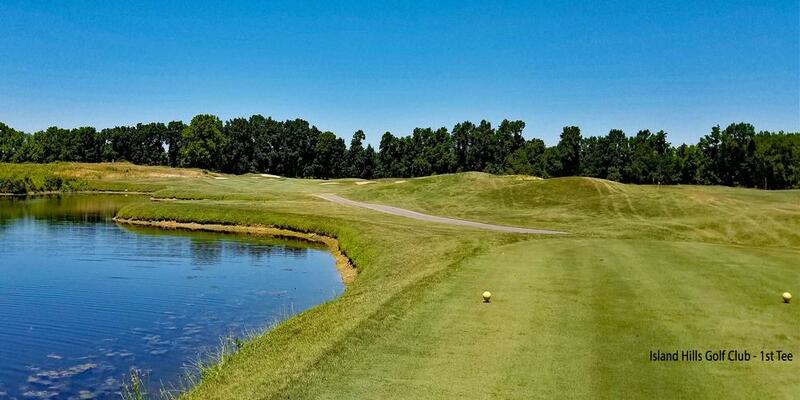 Your best shot off the tee is a draw over the water, biting off as much of the lake as you can. A good drive leaves a decision: Go for it or layup. The fairway splits in two with the high side on the right giving the best view into the green. There's also a creek that crosses in front of the green as well as a waterfall on the right. Distance control is critical on your approach shot into this multi-tiered green, which is one of the most challenging on the course. Congratulations; you've just finished playing one of Michigan's fines golf courses! I was told by several people before my visit that Island Hills has some of the best accommodations of any golf facility in the state and they were right. 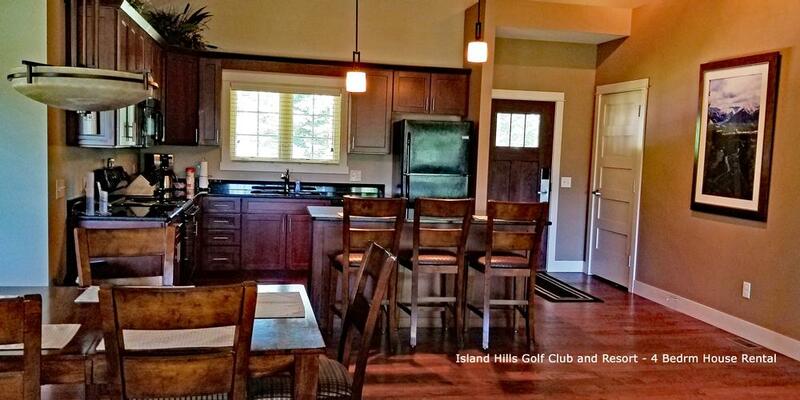 The 4 and 5-bedroom Golf Villas at Island Hills are luxurious and comfortable and overlook the par 3, 17th hole. The living areas and bedrooms were some of the most spacious I've ever encountered. Both the upper and lower level units have walkout balconies and fireplaces. Each villa has Wi-Fi and flat screen HDTVs with cable in every room. Lower level patios are equipped with gas grills for outdoor cooking. There's also a full-size refrigerator, electric range, microwave oven, ice machine, and dinnerware. Each villa also has a meeting room, making Island Hills a great place to hold a business meeting or family reunion. Cassandra's is located inside the Island Hills clubhouse. 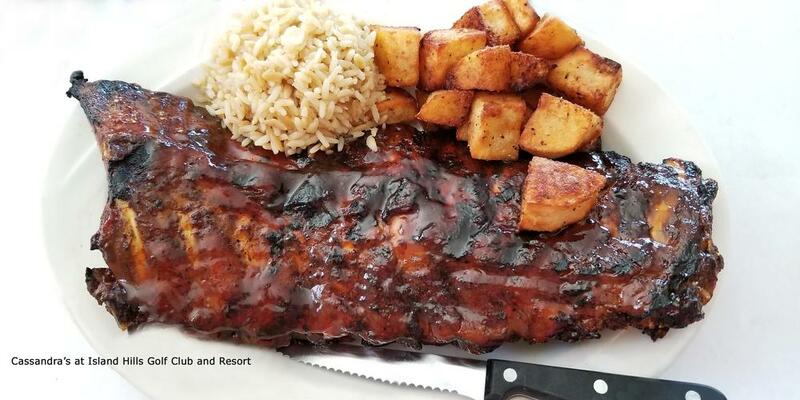 Cassandra's specializes in Steak and Seafood and offers a lake front dining experience that is open to the public. They have a full bar, live entertainment and every table in the restaurant has either a waterfront or golf course view. There is plenty of seating for large parties and groups. Their charred Ribeye is a favorite among locals and will most likely leave you with some to take home. Be sure to check out the nightly specials or as your server about them. The first 13 holes mix it up with a wide variety of terrain, tree lined fairways, and parkland style and open links style holes. For the most part, fairways are generous off the tees. Where Island Hills makes you earn your score is on the approach shots. Many greens have several levels so distance control is a necessity if you want to stick it close and score well. No two holes are alike and all provide a good test of golf for any level of golfer. The final five holes will determine your fate; get around them in less than two over and chances are, you've done well. If you're looking for a Stay & Play package, you won't find better accommodations anywhere in the state. The food at Cassandra's was delicious and the staff very knowledgeable and courteous.